哈伯超深空顯示有大量的小星系合併成大星系，在130億光年，當時宇宙的年齡只有現在的5%。This age estimate is now believed to be slightly shorter. ^ Planck Collaboration. Planck 2015 results. XIII. Cosmological parameters (See Table 4 on page 31 of pfd).. 2015. Bibcode:2015arXiv150201589P. arXiv:1502.01589. ^ 2.0 2.1 Staff. BICEP2 2014 Results Release. National Science Foundation. 17 March 2014 [18 March 2014]. ^ 3.0 3.1 Clavin, Whitney. NASA Technology Views Birth of the Universe. NASA. 17 March 2014 [17 March 2014]. ^ 4.0 4.1 Overbye, Dennis. 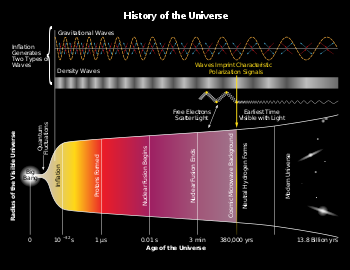 Detection of Waves in Space Buttresses Landmark Theory of Big Bang. The New York Times. 17 March 2014 [17 March 2014]. ^ Overbye, Dennis. Ripples From the Big Bang. New York Times. March 24, 2014 [March 24, 2014]. ^ 8.0 8.1 Ade, P.A.R. (BICEP2 Collaboration); 等. Detection of B-Mode Polarization at Degree Angular Scales by BICEP2 (PDF). Physical Review Letters. June 19, 2014, 112: 241101 [June 20, 2014]. Bibcode:2014PhRvL.112x1101A. PMID 24996078. arXiv:1403.3985. doi:10.1103/PhysRevLett.112.241101. ^ Overbye, Dennis. Astronomers Hedge on Big Bang Detection Claim. New York Times. June 19, 2014 [June 20, 2014]. ^ Amos, Jonathan. Cosmic inflation: Confidence lowered for Big Bang signal. BBC News. June 19, 2014 [June 20, 2014]. ^ BICEP2/Keck, Planck Collaborations. A Joint Analysis of BICEP2/Keck Array and Planck Data (Provisionally accepted by PRL). arXiv. 2015 [13 February 2015]. arXiv:1502.00612v1. ^ Clavin, Whitney. Gravitational Waves from Early Universe Remain Elusive. NASA. 30 January 2015 [30 January 2015]. ^ Overbye, Dennis. Speck of Interstellar Dust Obscures Glimpse of Big Bang. New York Times. 30 January 2015 [31 January 2015]. ^ Gravitational waves from early universe remain elusive. Science Daily. 31 January 2015 [3 February 2015]. ^ The Timescale of Creation 互联网档案馆的存檔，存档日期2009-07-28. ^ Gannon, Megan. 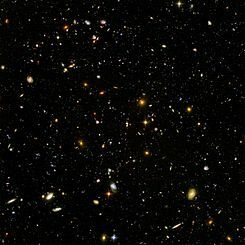 New 'Baby Picture' of Universe Unveiled. Space.com. December 21, 2012 [December 21, 2012]. ^ Bennett, C.L. ; Larson, L.; Weiland, J.L. ; Jarosk, N.; Hinshaw, N.; Odegard, N.; Smith, K.M. ; Hill, R.S. ; Gold, B.; Halpern, M.; Komatsu, E.; Nolta, M.R. ; Page, L.; Spergel, D.N. ; Wollack, E.; Dunkley, J.; Kogut, A.; Limon, M.; Meyer, S.S.; Tucker, G.S. ; Wright, E.L. Nine-Year Wilkinson Microwave Anisotropy Probe (WMAP) Observations: Final Maps and Results. The Astrophysical Journal Supplement Series. December 20, 2012, 208: 20 [December 22, 2012]. Bibcode:2013ApJS..208...20B. arXiv:1212.5225. doi:10.1088/0067-0049/208/2/20. ^ Hinshaw, G.; 等. Five-Year Wilkinson Microwave Anisotropy Probe (WMAP) Observations: Data Processing, Sky Maps, and Basic Results (PDF). Astrophysical Journal Supplement. 2009, 180 (2): 225–245. Bibcode:2009ApJS..180..225H. arXiv:0803.0732. doi:10.1088/0067-0049/180/2/225. ^ Amos, Jonathan. Quasars illustrate dark energy's roller coaster ride. BBC News. 2012-11-13 [13 November 2012]. ^ Loeb, Abraham. The Habitable Epoch of the Early Universe. International Journal of Astrobiology. October 2014, 13 (04): 337–339 [15 December 2014]. Bibcode:2014IJAsB..13..337L. arXiv:1312.0613. doi:10.1017/S1473550414000196. ^ Loeb, Abraham. The Habitable Epoch of the Early Universe (PDF). Arxiv. 2 December 2013 [15 December 2014]. arXiv:1312.0613v3. ^ Dreifus, Claudia. Much-Discussed Views That Go Way Back - Avi Loeb Ponders the Early Universe, Nature and Life. New York Times. 2 December 2014 [3 December 2014]. ^ Wall, Mike. 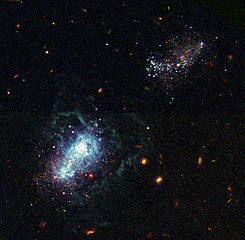 Ancient Galaxy May Be Most Distant Ever Seen. Space.com. December 12, 2012 [December 12, 2012]. ^ Cosmic Detectives. The European Space Agency (ESA). 2013-04-02 [2013-04-15]. ^ 36.0 36.1 K. P. Schroder, Robert Connon Smith. Distant future of the Sun and Earth revisited. Monthly Notices of the Royal Astronomical Society. 2008, 386 (1): 155–163. Bibcode:2008MNRAS.386..155S. arXiv:0801.4031. doi:10.1111/j.1365-2966.2008.13022.x. ^ J. Laskar. Large-scale chaos in the solar system. Astronomy and Astrophysics. 1994, 287: L9–L12. Bibcode:1994A&A...287L...9L. ^ Introduction to Cataclysmic Variables (CVs). NASA Goddard Space Center. 2006 [2006-12-29]. ^ Palmer, Jason. Hope dims that Earth will survive Sun's death. New Scientist. 22 February 2008. ^ G. Fontaine, P. Brassard, P. Bergeron. 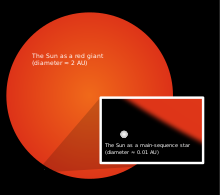 The Potential of White Dwarf Cosmochronology. Publications of the Astronomical Society of the Pacific. 2001, 113 (782): 409–435 [2008-05-11]. Bibcode:2001PASP..113..409F. doi:10.1086/319535. ^ 42.0 42.1 42.2 42.3 A dying universe: the long-term fate and evolution of astrophysical objects, Fred C. Adams and Gregory Laughlin, Reviews of Modern Physics 69, #2 (April 1997), pp. 337–372. Bibcode: 1997RvMP...69..337A. doi:10.1103/RevModPhys.69.337.